Sir David Willcocks MC, former chorister of Westminster Abbey, speaking at our 2007 annual dinner. 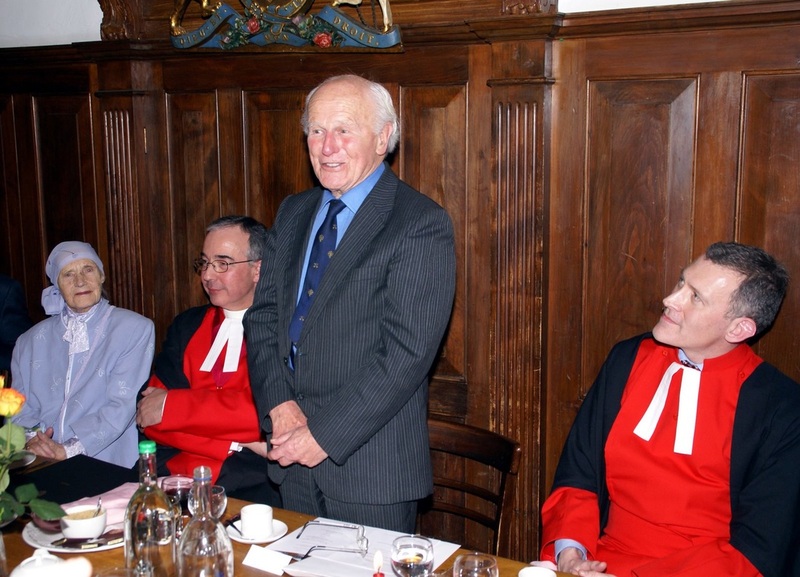 Sir David last attended our dinner in 2012 when John Rutter was the speaker and who took Sir David home to Cambridge in foul and freezing weather, finally reaching home after 1am. John Rutter reported that Sir David was still 'firing on all cylinders' when they arrived in Cambridge. Sir David Willcocks, who has died aged 95, was the most influential choirmaster of his generation, spending 17 years as director of music at King’s College, Cambridge, and 38 years in charge of the Bach Choir. He was a man of immense courage in both musical and military fields, earning an immediate MC during his war service in Normandy. Throughout his long career Willcocks was at the centre of British choral music, moulding voices and raising standards. He injected it with a sense of purpose and redefined its sound while building up a strong base of support through his connections with choral societies across the country. Every note he conducted had to be articulated with precision and every phrase expressed with clarity; the result was an intense beauty of sound. Everything was meticulously rehearsed, including a choir’s entrance and exit from the stage. For many listeners the pure, vibrato-free sound of the choirboy’s voice cannot be bettered: it is smooth, perfectly in tune, and unconcerned with the cares of the adult world. Nowhere is this more exemplified than in the annual Festival of Nine Lessons and Carols from King’s, with which Willcocks was indelibly connected thanks to his descants to carols such as O Come, All Ye Faithful and Hark, the Herald Angels Sing. The service is broadcast throughout the world annually on Christmas Eve. A boy was allowed one yawn at the 8am rehearsal, but a second would mean putting his head under a cold tap. Those who made mistakes in rehearsal were expected to raise a hand to admit their error, while a fluffed note during a service meant queuing up after the Dismissal to apologise. The many household names he trained in their formative years included the conductors Sir Andrew Davis and David Angus, and the tenor Robert Tear. Adult singers loved him, too. Whether conducting the metropolitan elite of the Bach Choir — which has counted the Duchess of Kent and Leopold de Rothschild among its members and the Prince of Wales as its president — or the massed ranks of the Bradford Choral Society, whose performances he conducted four times a year between 1956 and 1974, Willcocks was assured of a warm reception. He could also be relied upon to drive his singers towards greater heights in even the most difficult of choral works, such as Britten’s War Requiem, one of the 20th century works with which he was most closely identified. To the lay musician Willcocks will probably be best remembered for editing, with Reginald Jacques, Carols for Choirs, in which the bulk of Christmas music in popular use today can be found, and its successor, Carols for Choirs 2, with John Rutter. His approach was the antithesis of the early music movement. Where their major thirds were falling flat, towards a minor third, Willcocks’s would be heading north. He had a joke scale, sung in the pub after evensong, in which the major third was above a perfect fourth and the major seventh above an octave. When accompanying psalms he had a different organ stop for every occasion: he could make the birds twitter and, when the plagues struck in Egypt, the bugs and the snakes each had their own sound. A verse that read “my foot had slipped” would be accompanied by a glissando on the pedals. All were delivered with the characteristic Willcocks smile. David Valentine Willcocks was born at Newquay, Cornwall, on December 30 1919, the youngest of three sons of Theophilus, a provincial bank manager, and Dorothy; his middle name came from his baptismal date. By the age of six he was playing the cello and at seven was taken from Cornwall to London to meet Sir Walford Davies at the BBC, who recommended him to Westminster Abbey. He was a chorister there from 1929 to 1933, fully immersed in the music and liturgy of the Church of England. Although his time at school was happy, not all was plain sailing. He was caught on three occasions with Woodbine cigarettes – sufficient recidivism to cause him to be sent home. However, he was spared that disgrace by arguing that it had been an abuse of trust for Matron to rifle through his pockets while he slept. He won a scholarship to Clifton College, Bristol, in 1934, where he represented the school in cross-country running. He then spent a year at the Royal College of Music and, in 1939, was appointed organ scholar at King’s College, Cambridge. His first broadcast service was a somewhat poignant Nine Lessons and Carols on that first Christmas Eve of the war. In May 1940 he was commissioned into the Duke of Cornwall’s Light Infantry (DCLI), serving with the 5th Battalion as an intelligence officer for the rest of the war. On one occasion his unit, which included an officer by the name of George King, was visited by the monarch, giving Willcocks the opportunity to say: “Your Majesty, I beg leave to present George King, King George.” On another occasion he was fortunate to avoid a court martial after using a military vehicle to return a group of Wrens to their base; he instead received a severe reprimand. His battalion took part in the Normandy landings in June 1944; before long Willcocks, ever the morale raiser, tracked down a piano and played it while under heavy shell fire. One of 5 DCLI’s objectives was the capture of Hill 112; the Germans had a saying: “He who controls Hill 112, controls Normandy.” Willcocks’s division was ordered to take it at any cost. They did, but paid a very heavy price, including the loss of their commanding officer. The information that Willcocks, then a captain, transmitted during the action proved vital in breaking up the enemy counter-attacks. He was awarded an immediate MC and was decorated by Montgomery on November 30. After the war he was stationed in Germany, resuming his music and learning to ride a horse. He later took up surfing, a hobby he continued into his eighties. Eventually he returned to Cambridge, completing a degree in History and Economics as well as his MusB. In 1947 he was invited to become organist and master of the choristers at Salisbury Cathedral in succession to Sir Walter Alcock, whose funeral was Willcocks’s first service there. Within three years he had transformed an “also-ran” choir from its repertoire of staid Victorian works to one which gladly sang the 20th century music of Howells, Sumsion and Britten. Willcocks explained that they were preparing for the following day’s services. Back came the reply: “Our Lord is still in the tomb; I will not have it! We cannot have 'hallelujah’ sung in Salisbury Cathedral until the gladsome morn.” Thereafter the choir replaced the offending word with “fa-la-la-la”. He had only been there three years when he was invited to Worcester Cathedral in succession to Sir Ivor Atkins, who had been a close friend of Edward Elgar. The post came with the added attraction of directing the triennial Three Choirs Festival and the opportunity to conduct the City of Birmingham Choir. He sought advice from Adrian Boult, who urged him to accept. There he was able to conduct most of Vaughan Williams’s major works in front of the composer, later recalling how Vaughan Williams would say: “I want people to feel my music living within them.” However he had to contend with objections from the Dean and Chapter to Walton’s Belshazzar’s Feast because of its “blasphemy”. He also conducted the first British performance of the Requiem by Duruflé in 1952. In 1957 he was appointed organist and director of the choir at his old Cambridge college where Boris Ord, the incumbent, was suffering from a degenerative illness (Willcocks, in the meantime, turned down an offer from Eton College). He took the choir on tours of Europe, Canada and Africa. He was also conductor of Cambridge University Music Society for 16 years from 1958, university lecturer from 1957 to 1974 and university organist for the same period. Although the choir of King’s had achieved national fame under Ord through its Christmas Eve service, it was under Willcocks’s direction from 1957 to 1974 that it gained international recognition through recordings, such as that of Fauré’s Requiem, and the expansion of its repertory. The famous recording of the Allegri Miserere, with Roy Goodman as treble soloist, was made in one take, but it nearly did not happen because Goodman had been playing rugby and the match went into extra time. Thanks to the proximity of Cambridge to Aldeburgh, Willcocks was able to work with Britten, who in turn invited the King’s choir to his festival. Willcocks also conducted the first performance in Italy of the War Requiem at La Scala, Milan, in 1963, a year after its first performance in Coventry, and performed it in Japan, Portugal and the Netherlands. And it was from Willcocks’s charges that the King’s Singers first emerged in the 1960s. He left Cambridge to become director of the Royal College of Music in succession to Sir Keith Falkner. There he reorganised the college’s syllabus and brought in international artists as teachers. His “iron fist in a velvet glove” approach to administrative tasks ensured that the changes he sought were comprehensive; among his many achievements was the successful appeal to finance the Britten Opera Theatre. He made a point of always conducting the first years’ choral class. He retired from the college after a decade. With the Bach Choir, where he succeeded his Carols collaborator Reginald Jacques, he conducted the choir in the first complete recording in English of Bach’s St Matthew Passion in 1978. Their annual performance of this work was a major event in the London musical calendar. The choir, under his direction, also sang at the wedding of the Prince of Wales and Lady Diana Spencer in St Paul’s Cathedral in 1981. One of his most memorable performances was in October 1982 when he celebrated Herbert Howells’s 90th birthday with a gala performance of the Missa Sabrinensis. It had been coolly received at Worcester in 1954 but was acclaimed on this occasion. In 1969 Willcocks had astonished the more traditional members of the Bach Choir when he announced that they were to cut a track with the Rolling Stones and Mick Jagger. You Can’t Always Get What You Want became the flipside of Honky Tonk Woman. Meanwhile his “from scratch” occasions at the Royal Albert Hall, where 4,000 amateur singers from all over the country would turn up with their scores to sing through a choral work under his direction, became a popular institution. A gentle, unassuming man, Willcocks was renowned for his small acts of generosity. When an impoverished, but highly talented, Roy Massey (who went on to be director of music at Hereford Cathedral) enquired about the cost of lessons, Willcocks replied: “Let’s not bother about that. When I’m on the parish in my old age you can support me.” He was a popular adjudicator at music festivals around the world. On one occasion in Trinidad, in the West Indies, he found himself listening to steel bands that had arranged works such as Beethoven’s Moonlight Sonata, which they played on tempered oil drums. He later said: “I thought, 'I just don’t know how to judge these people’, so I judged them purely on the pleasure they gave me.” For an organist he had remarkably small hands, and was unable to span a tenth on the keyboard from thumb to little finger. He regularly beat Robert Tear, 20 years his junior, at squash. Willcocks was appointed CBE in 1971 and knighted in 1977. In 1947 he married Rachel Gordon Blyth, a parson’s daughter whom he met while conducting the Cambridge Philharmonic Society in the St Matthew Passion, although their parents had been acquainted. She survives him, with two daughters and one son; another son predeceased him.